As our lives get busier, boundaries between work and leisure blur and we spend less time thinking about what we’re putting our minds, bodies and souls through. This fast-living is resulting in a pandemic of ‘ill-being’: from general weariness and ‘feeling under the weather’, to prolonged bouts of sickness, lethargy and increases in stress, depression and mental health issues. The Wellbeing Book is the antidote to the pressures of modern life and provides 50 fast-acting, simple and effective ways to enhance energy and build resilience, cultivate emotional and physical wellbeing, manage stress and live a happier, more fulfilling life. The First 300 - The first 300 copies of The Wellbeing Book are individually numbered, and signed by the author with a personal message for you. But when they’re gone, they’re gone. Click here to get yours now. Enter the code ‘SUVAROV’ at Checkout and if you’re one of the First 300 the special edition will be on it’s way to you. Someone asked me this morning, ‘Have you got five minutes?’ I thought ‘no’ and said ‘yes.’ I get caught in the pattern and wonder where the time goes and how to break out of the cycle. The Wellbeing Book offers us the chance to take five, draw breath and find our way back to what makes us tick. The Wellbeing Book cuts to the chase and delivers huge value. A small book yet a powerhouse of ideas, advice and action. 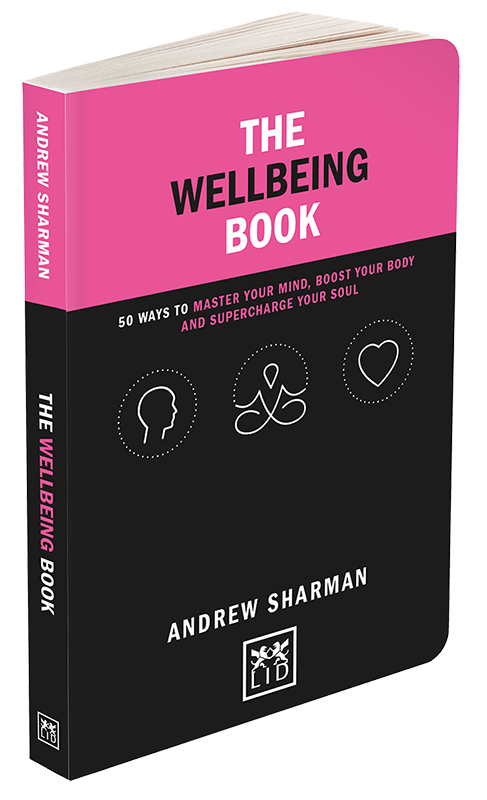 Wellbeing is not a ‘nice-to-have’, it’s a total ‘must-have’ and Sharman helps you find exactly how to improve yours.